Is there any problem applying tumble dry after washing MIKI HOUSE products? Our products carry generally the labels showing how to wash and you are requested to respect the instruction. 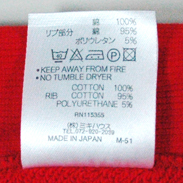 Especially the drying in the tumble dry is strictly prohibited for a risk of shrinking.